A game that I really enjoy, but haven't written about much in the past, is Ziggurat. I picked it up about a year or so ago on a whim, and found myself really enjoying the way that it combined Heretic or Hexen-like dark fantasy FPS action with roguelike level randomisation, permadeath, and difficulty. I didn't think that I'd be playing a game that's almost a precise clone of Ziggurat, but with a different coat of paint and theme, but such are the mysteries of the universe. 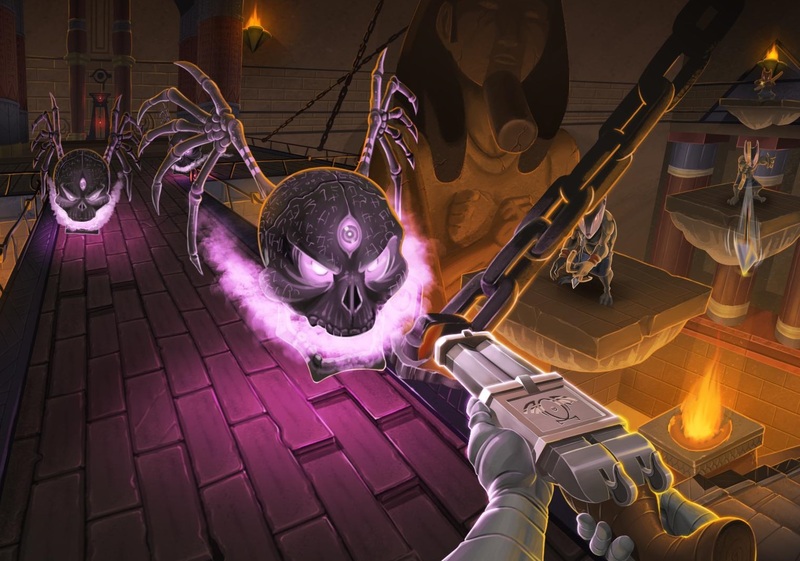 I don't know if it was intended or not, but Immortal Redneck, a game that I've had the opportunity to get some hands on time with in the leadup to its release in a month, is exactly that; it plays just like Ziggurat, but instead of the dark fantasy setting, this one throws you into mythological Egypt, and that is exciting stuff. As you can see, even in the early stages, the gunplay is clean and fast, the game moves smoothly, and it's absolutely gorgeous on the eyes. The developers have done a really good job making the environments vibrant and colourful, the enemies interesting, and the soundtrack that accompanies the action is really good stuff too. Of course there is the potential for things to fall down as I play on. With roguelikes there's every chance that poor balancing can make progress a decidedly boring grind, or random level design can become overly repetitive and uninspired. These are things I simply won't be able to tell until I've had the chance to spend more time with the game. But for now I'm quite optimistic on it. The title of the game alone meant that it most certainly wasn't on my radar as a game I'd want to play, but now that I've had some time with it, it may well become something that, like with Ziggurat, I spend more time playing than I ever would have thought, given that it's a FPS and all.